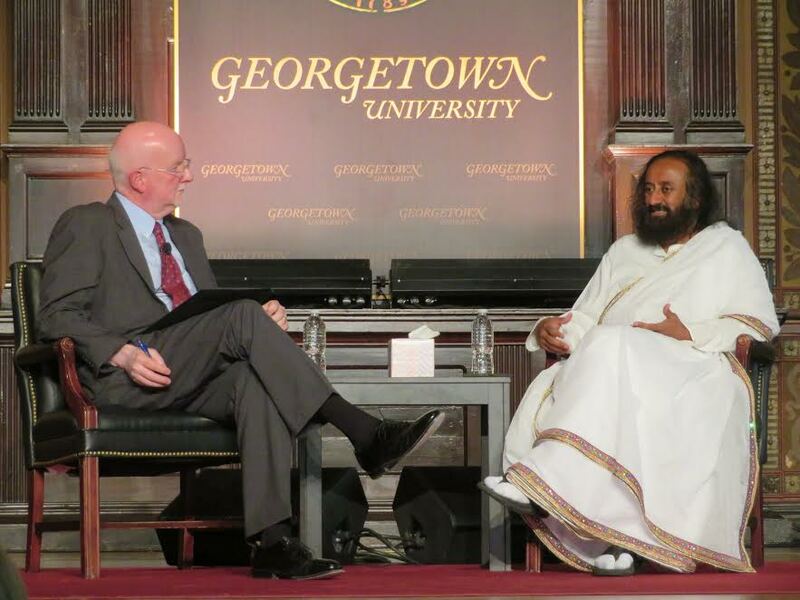 Spiritual leader Sri Sri Ravi Shankar (right) in conversation with Shaun Casey, director of Georgetown University’s Berkley Center for Religion, Peace and World Affairs. The event, titled “Interfaith Harmony and Service,” was hosted by the university’s India Initiative on April 22, 2018, at Georgetown’s Gaston Hall. 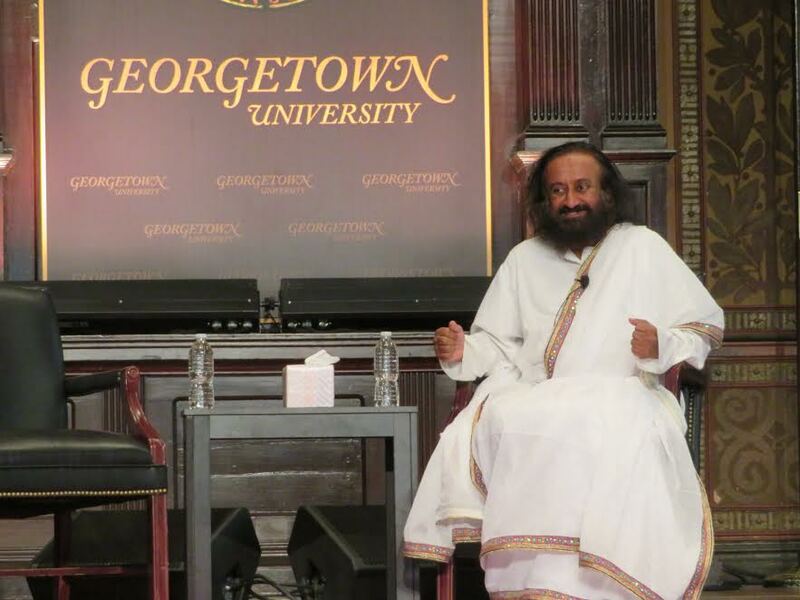 WASHINGTON, DC: Addressing a packed hall at the prestigious Georgetown University on a Sunday evening, world renowned spiritual leader, humanitarian and peacemaker Sri Sri Ravi Shankar shared his unique knowledge of meditation and the important role it can play in overcoming polarization. Noting that impatience and aggression are on the rise, he affirmed, “Meditation can help. It can definitely bring about more patience and understanding. It can create room for the ‘other’, bring a certain calmness to embrace people who are different from you. Somewhere deep inside if you are fearful of the ‘other’, if you feel threatened, that’s when we become more aggressive towards the other. You try to build walls which are artificial,” he noted. “To reach out to others it is important that we first find ourselves in a very stable, calm, serene space. Without that, I don’t think it is possible,” he said. Sri Sri, or Gurudev as he is reverently called by millions of his followers, was responding to a question on polarization in America by Shaun Casey, Director of the Berkley Center for Religion, Peace and World Affairs at Georgetown University and former director of the Office of Religion and Global Affairs at the US State Department. The event, titled “Interfaith Harmony and Service,” was hosted by the Georgetown University India Initiative on April 22, and drew a packed crowd to the spacious Gaston Hall. It is noteworthy that Sri Sri heads The Art of Living Foundation, reportedly the largest non-profit organization in the world reaching over 370 million people in 155 countries. Casey queried the humanitarian hero on the issue of refugees citing estimated figures of 20 million refugees in the world and 40 million people who are internally displaced in their own country, with the numbers rising. He wanted to know what tools and techniques does the Art of Living founder use to help them and give them the dignity they deserve. Sri Sri responded by saying it was necessary to understand their psychology, the fact that they are in a state of shock and fear. At the same time, he mentioned that refugees need to understand that they have come to a host country. “We need to work on both sides: the host as well as the immigrants,” he said. “The immigrants need to integrate with the society they are in. They cannot resist the language; they cannot resist the customs, traditions.” Recognizing that they need to adapt to the situation which may be difficult initially, he believed the process should be facilitated. “If you offer me clothes for converting to your religion, I feel that is downgrading one’s own religion,” Sri Sri said to cheers. “The choice must be theirs (refugees/immigrants), not with some sops. What do you think?” he asked the audience who cheered even louder. He disclosed that his grandfather lived with Gandhi for 20 years and that he himself grew up listening to stories about him. “In those days, pride was attached to non-violence, unlike today when aggression is somehow wrongly associated with pride,” Sri Sri noted. “In schools and colleges, if someone is very aggressive, that is a sign of being macho. If you are loud or scream, that is a sign of being a leader. When we were growing up, we were looked down upon if we lose our temper because non-violence and equanimity of mind was what Gandhi stood for all his life. I find that if you spiritualize the politics, the world would be a much better place,” he said to applause from a full house. Spiritual leader, humanitarian and peacemaker Sri Sri Ravi Shankar addressing a largely academic audience at Georgetown University in Washington, DC, on April 22, 2018. Joel Hellman, Dean of the Walsh School of Foreign Service at Georgetown University, delivered opening remarks to the talk on the role of spirituality in improving interfaith relations around the world. The event capped off the second annual India Ideas Conference hosted by the academic institution. Sri Sri began by leading a guided meditation. The stillness in the spacious hall was palpable. Sri Sri believed one must “appreciate the goodness in all faiths” and “embrace wisdom and knowledge with open arms” while keeping one’s own faith and traditions. “Deepen your roots, broaden your vision,” he said to much applause.